A horrified bride has shared the dress her mother-in-law intends to wear to her wedding. 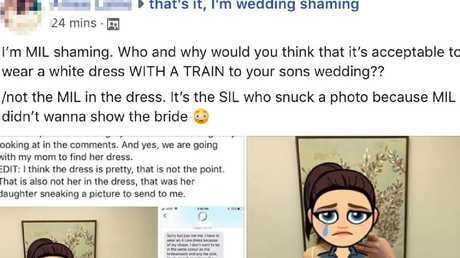 A BRIDE has slammed her future mother-in-law for buying a white dress with a train to wear on her big day. Though the dress features a floral design on the white fabric, it's flowing bridal-style train has caused the bride concern due to its striking resemblance to a wedding gown. When the worried bride confronted her fiance's mother over the design she was stunned when she refused to change it, saying the permitted pink, blush and peach colour theme "wash me out". As a result, social media users have branded the controversial outfit choice "disrespectful". The horrified bride has shared her dismay in a lengthy post on Facebook asking, "Is it as bad as I think it is?" alongside a photo of the offending outfit. "Please tell me it's as bad as I think it is and I'm not overreacting for it being too white," the post read, explaining the mother-in-law went behind her and her son's back to buy the dress. 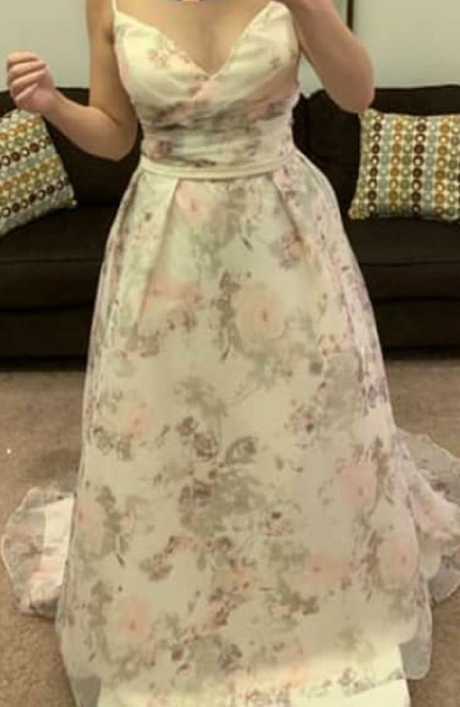 A horrified bride has shared the dress her future mother-in-law intends to wear on her big day, asking if it is as “bad” as she thinks it is. She continued: "We gave her around five colours to pick from in our theme and tried to make it fun for her because she's been so unexcited about the whole wedding." But despite taking her for a day of shopping, the bride said she received a text from her future mother-in-law telling her she'd bought a dress on her own. After refusing to show her the design, the groom's little sister sneakily snapped a photo of herself in the dress, revealing the bride's worst fears. "I don't want to be the same colour as the bridesmaids and any light pink, blush, peach colours like that wash me out," the mother-in-law wrote. She continued: "I'm sorry that y'all don't think I can pick out a presentable dress for your wedding. 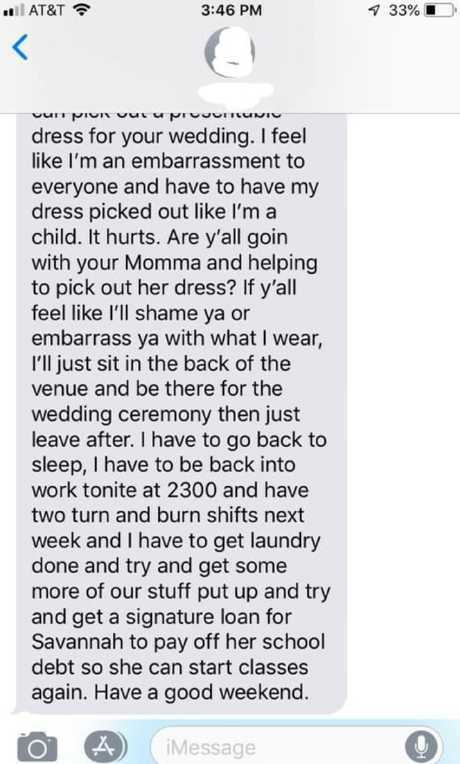 A screenshot of the mother-in-law’s ‘manipulative’ text was also shared, where she explained the saga had caused her to feel like she’s an ‘embarrassment’ to the bride and her son. She went on to say that if she felt like she was going to "shame" or "embarrass" her with what she wears to the ceremony, she'll "just sit in the back". Many brides quickly leapt to her defence, declaring her future in-law was being "cringe worthy" in a wedding shaming group on Facebook. "Who and why would you think that it's acceptable to wear a white dress WITH A TRAIN to your sons wedding??" one person wrote. "The audacity of some people …" another fumed. Another said: "No one wears white to a wedding … It's disrespectful. It's their day don't ruin it by wearing something with a train or white." While someone else suggested she let her show up to the wedding in the controversial outfit. "She'll look trashy AF and cringeworthy and has to stand there through the embarrassment of her attempt to be in the limelight being so obvious, or leave. Perfect punishment for the crime." The bride’s post was shared in a wedding shaming group where they branded the mother-in-law “manipulative” and “cringe-worthy”. Others thought her response was extremely "manipulative". "The whole emotionally manipulative thing of 'Oh I'll just sit in the back and leave right after' sob story makes me sooooo mad," someone said. Another vented: "Holy emotional manipulation!!!" However, there were many that defended the mother-in-law, saying they couldn't see it "passing" as a wedding dress. "Without the train I can't see this passing as a wedding dress, so maybe if she can get it altered?" one person suggested. Another agreed: "Aside from the train the dress doesn't actually bother me. I can't see it upstaging the bride who I'm sure will look 1000 times more eye-catching." Do you think the mother-of-the bride has crossed the line choosing a white dress for the big day? Or is the bride being too controlling? Let us know your thoughts below.